Buckeye 2019; Serotiny – Buckeye Gathering! Serotiny: when seeds are released by the prompting of an environmental process, notably fire. It’s quite the transitional year for Buckeye! In 2019 we are taking a breath to revision and tend to our land base. After nine years as an Ancestral Skills gathering in Northern California, built from the model of older gatherings like Earthknack, Rabbitstick, and Wintercount, we decided to undergo a Chrysalis process. Like the caterpillar ready to morph, it is a time for us to rest, digest who we have been, do some organizational cleaning, and listen for what these times may be specifically asking from Buckeye. On the heels of that choice, the Camp Fire burned the Lake Concow site in the Sierra foothills where we have gathered for five years. We have taken it as a sign to not run either Buckeye or Pathways as planned, but rather dovetail a land-focussed year with our own redesign. It has taken us a few seasons to clearly see how to be on the land well this May, given a flock of factors, notably how ready the land and caretakers are for us to be there; thanks for your patience. 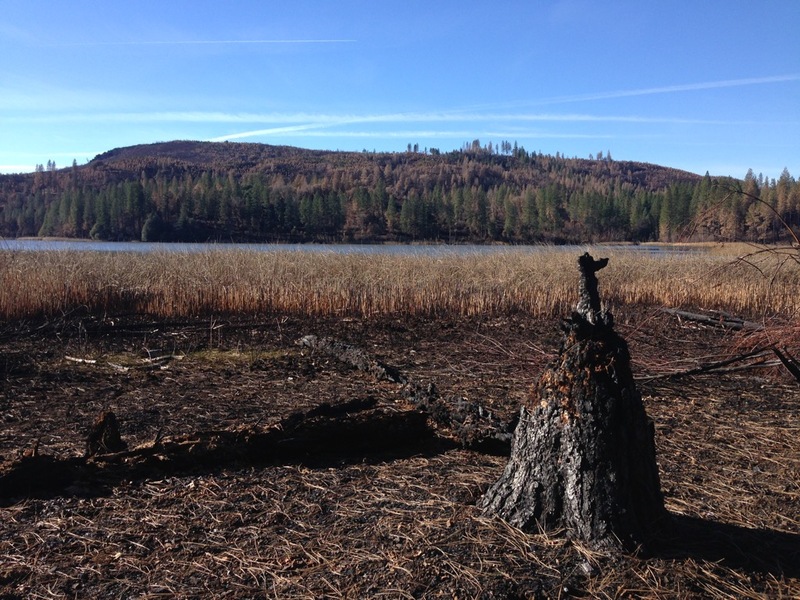 Our intention this year is to deepen our relationship to the Lake Concow area by exploring how we might tend to the impacts of the fire in a healthy and reciprocal way. We will be exploring, from a land base that we have been getting to know for a few years now, a spectrum of cultural and ecological factors contributing to the complexities of fire in our times, and joining the widespread conversation about how to best move forward in local and bioregional communities. We will also be watering seeds for our future, by spending time independently as organizers and allies during and just after this week in our organizational revisioning process. Buckeye this year will look different than it has in the past; the learning this year will be less formal. We will not be hosting a specific palette of Ancestral Skills classes; the soonest that would return is 2020. This May 8th ~ 14th we will gather at Lake Concow, near Chico, with a group of no more than 100 folks for a dynamic, co-creative opportunity to be in conversation and tend the land post-fire. Fire ecologists, naturalists, trackers, crafters, various dedicated land-oriented folks and other teachers will be present, to lead and take part as makes sense. 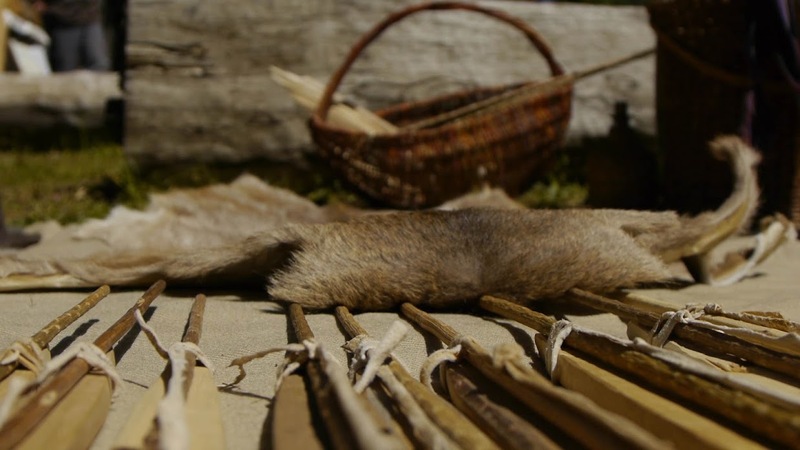 A main source of inquiry will be the perspectives of Indigenous land management and Traditional Ecological Knowledge. We will be organizing each day depending on who is present, the flow of the week, and how our conversation unfolds. We are aiming to maximize the surface area for sharing and learning, while being flexible with what possibilities emerge. The first and last days will be dedicated to setting up and taking down camps. 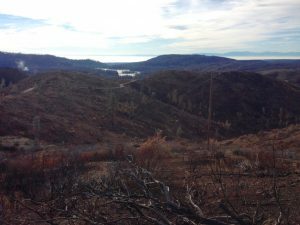 During the five days in between, outside meal times, we will be organizing dialogues and time on the land primarily around fire ecology; we foresee a few individual talks, perhaps a panel or two, small group discussions, and field time together listening, in conversation, and doing some hands-on land work. You will be free to join whichever activities you are drawn to; it’s likely that there will be one to three main activities happening at a time, depending on how many people attend. There is some tending which clearly needs to be done, such as removing exposed barbed wire and filling fire trenches. Beyond this, exactly what ecological work is best after a fire is both specific to zones and dependent on a spectrum of factors. The possibilities are myriad: there could be understory tending, seeding, or even a prescribed burn (!). We will also be continuing our tracking and monitoring of the plants, animals, and natural processes to see how these are changing with the fire. There may be harvesting and crafting that fits the season and circumstances, such as woodworking. To attend, we ask that you fill out the following short application. This will help us see how many of you will be joining us, and to get a sense of what skill sets and capacities you are bringing. If you would like to join us, this is an opportunity to contribute to a collectively run camp. The Buckeye team will not be providing food or infrastructure: cooking and childcare, for example, will be happening in groups or individually. There is no set price this year; attendance is by donation. We will have some costs to cover, and are excited to see how a contribution model will shake out. You will have the chance to donate both before coming, in the Welcome letter, and onsite once we all see what the co-learning process looks like. In our ongoing commitment to learning how to best steward equitable spaces, our Native and PoC Scholarships are available this year as a stipend to offset travel and food costs; there is more information on the application. We will send you a confirmation and information packet soon after you apply. We hope you will be as excited as we are to work and learn about fire and land tending together! A big thanks to the Lead to Life organization for the encouragement to share the use of the word ‘serotiny’, and the invitation to dream together as organizations in guiding metaphor. Below is our letter to the community in January, which you may have already read as an email. It speaks to what we learned from visiting the land, and why we are running a minimal event this year. 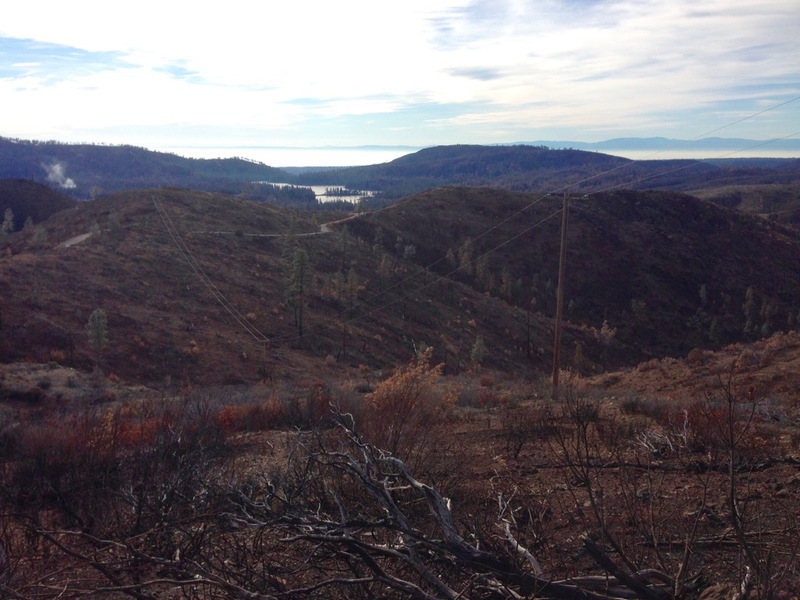 The photo above is from the headwaters that feed the reservoir, (which you can see in the distance), where the fire moved quickly from ridge top to ridge top, and for the most part burned very hot. Lake Concow is muddier right now than we have seen it, as the rains are washing soil downhill. 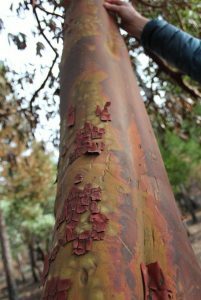 The photos below are at the campground, where the effects were complex, and, in our understanding, beneficial in many ways. Only a few of the tall pines, oaks, and madrones were severely scorched. In several places, low, thick brush, was burned out. As many of you know, this is healthy for the ecosystem ~ to clear out the dead fuel load that has accumulated in so many places due to fire suppression and lack of intergenerational human tending. 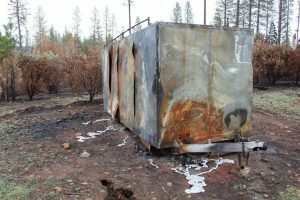 Most of the structures on the land did burn: the ’roundhouse’, the stage, the community house up top, most of the trailers and vehicles onsite, some of the pit toilet bathrooms, and a Buckeye trailer full of mostly kitchen gear. Here is our page of photographs from the Camp Fire at and around Lake Concow. 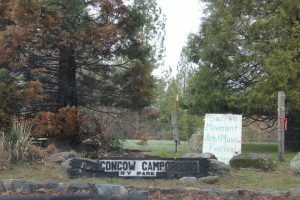 Lake Concow Campground is stewarded by a partnership of families, all of whom had pretty major losses, including, for some of them, their homes offsite. Like thousands of folks in Butte County, they are now in whatever temporary living conditions that they can find during the housing crunch. There is a hopeful and proactive sentiment in the air though, for instance in securing a grant already to repair the water systems. Many of you know Monica and Carl, who live down the road and turned us on to Lake Concow five years ago. Sadly, their place burned pretty hot and they lost a treasured home and several structures, hand built with love and skilled craft. This all speaks to where the grief, quite real throughout the region this winter, lies: in the human losses, in the loss of -home-, and in the impact of toxic remains of human industrial production running into the watersheds and into the soils. For Buckeye and Pathways as annual events, the timing of the fire is auspicious. We had just announced a Chrysalis year, a hiatus from the main week of Buckeye to just focus on Pathways, take a rest, and do some internal re-visioning. We have spent the subsequent months ruminating on what to do with the week that we set aside for Pathways, May 8-14. Thanks to the numerous folks who offered to host us, or help us find a new spot this year! Despite this generosity, it has been an easy decision to return to the lake, to the little creek that roars now and gurgles in the summer, to our ongoing relationships with that place. It’s also more than we want to bite off to move our whole operation to a new site, especially with our loss of gear; we know how much work that takes. Also big thanks to all the folks who have inquired, and offered to help. There is obviously a lot of care in our community for Lake Concow and Buckeye! For a spectrum of reasons, we have chosen not to run Pathways as usual this year. On our visit to the land, we were both happy to see how resilient and healthy it is, and noted how tender it still feels; too early to host a big group. Since much of our kitchen gear burned, our capacity to feed lots of folks is tempered for the moment. It is also unknown how available the campground will actually be in May, for a couple reasons. The FEMA-funded Butte County cleanup team is in high demand, and may still be working onsite. 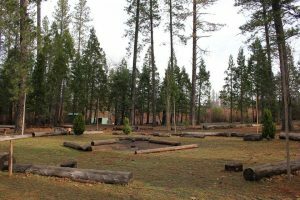 When the campground does open back up, some partners and community members will be living there temporarily, and none of us are sure what that looks like yet. In 2008, after the last fire, dozens of locals lived at the campground, for up to a few years. The amount of time we have until May to organize an event has gotten shorter since November when we were starting to work on Pathways. 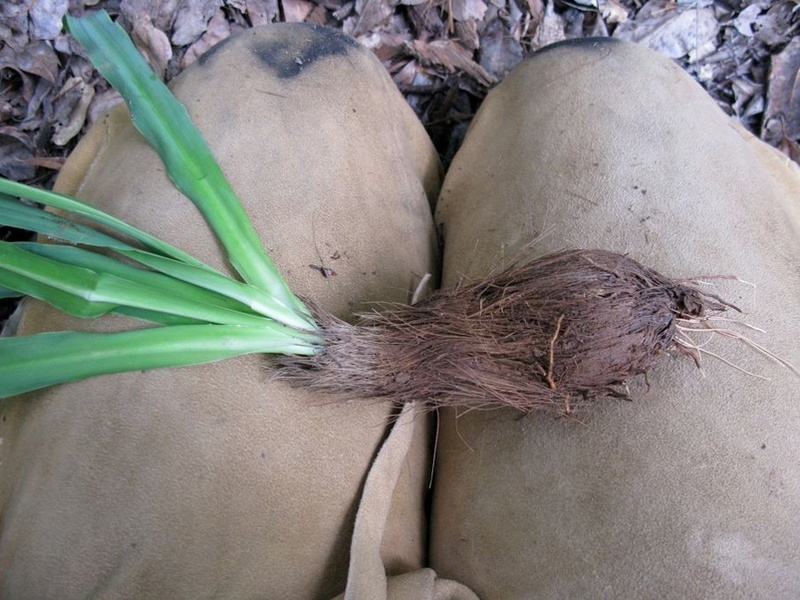 Basically, the situation is full of unknowns and emergent properties, and we want to be able to be flexible, especially to watch for what is actually helpful on the land, come this May. What we do know is that the land itself knows how to recover, and it would be shortsighted of us to do too much too soon. 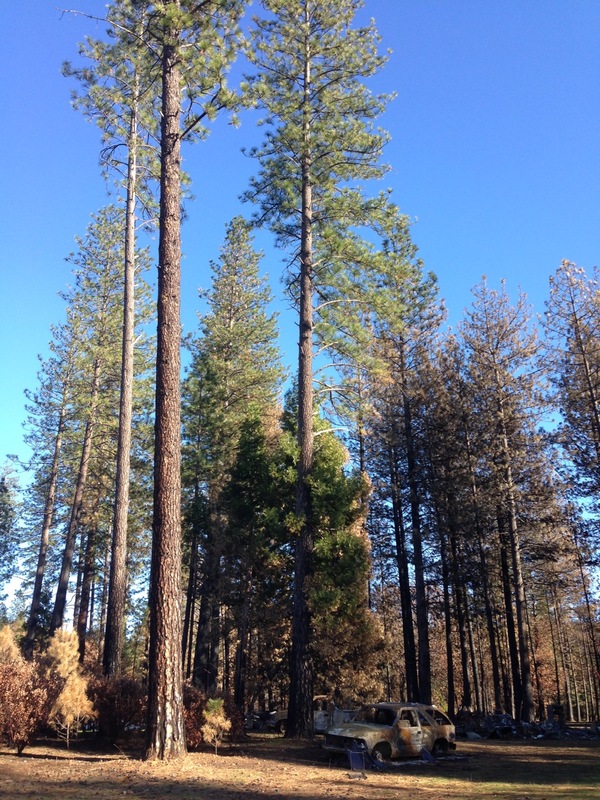 Though it’s tough to know exactly what our presence will look like this year, we will host a small group dialogue about fire ecology, with an openness to some land tending work, as appropriate. Whatever happens, it will clearly involve italics. Practicing being adaptive seems pretty wise, anyways. One aspect of Buckeye and Pathways that will continue this spring is our effort to track the plant and animal communities, and extend our efforts to long term curiosity and monitoring of the local ecosystem in relation to post fire changes; this will likely be a a class offering. A few other possibilities are in the mix, including building a small earthen structure at Carl and Monica’s place. Land tending work at Lake Concow Campground: to clean up some effects of the burn; to encourage the benefits of the fire, informed by indigenous knowledge and permaculture, to materials for rebuilding basic needs such as bathrooms, and to revisioning and building new simple structures from natural materials. If you want to support the greater community affected by the Camp Fire, you can donate to the North Valley Community Fund for Camp Fire relief who is poised to dole it out to local groups that are working directly with those in need. Don’t forget about other Ancestral Skills Gatherings coming up: Wintercount, Arizona, February 10~16; and Acorn, SoCal, March 25~30. Thanks for taking the time to read this, and for being on the journey with us!